Insuring our valuables and the precious things that we have is essential. If you own physical gold, silver or other precious metals, you would not like to risk loss of a part of your wealth. But are you sure that the insurance of your gold and silver really provides full coverage, full in terms of the full value being insured, and in terms of really being insured against all risks? Gold investors who hold a relative small amount of gold, typically some gold coins and perhaps some bars, are often renting smaller security deposit boxes from banks. However, it is getting more and more difficult to find available security deposit boxes at banks. Generally spoken, the lessee of security deposit box is himself or herself responsible for the insurance of the valuables kept in the security deposit box. The content of security deposit boxes at banks is not automatically covered by a bank’s own insurance. The annual rent for security deposit boxes at banks may or may not include insurance. In cases where the security deposit box rent does include insurance, it’s worth to have an eye on the coverage. While some banks are providing insurance coverage against fire and robbery for up to about EUR 70.000, some banks only provide insurance coverage up to EUR 1.500. The value of few gold coins or a small gold bar does already exceed such a small coverage. In this case, you should arrange for your own insurance coverage, or you may be able to include your gold in your security deposit box in your household insurance if the conditions allow for. Bank customers who buy a bit larger amounts of gold or other precious metals like silver, platinum or palladium from a bank will not be able anymore to store their gold bars or gold coins etc. in the bank’s security deposit boxes, because they are too small. Typically, the bank will issue a certificate or confirmation to the customer, confirming that he or she bought X amount of gold or silver or other precious metals. The important point here is that you own rights on a specific amount of gold that is stored in the bank’s vaults, but you are not the assigned owner of specific gold bars with specific serial numbers. “Your” gold remains in the assets of the bank and is used by the bank to maintain its own liquidity ratios. This type of storage is called unallocated storage. The gold of the bank is of course insured. However, insuring gold is expensive, the premiums are high. Therefore, most banks sign an insurance coverage up to a certain amount, let’s say up to EUR 600 million, but then store gold, silver or other precious metals worth EUR 1,5 billion. In other words, only 40% of the entire gold and other precious metals in the bank’s vaults are insured. The idea behind this is, other than the cost concerns of the bank, the assumption that robbers would not be able to steal the entire amount of gold etc. stored. If a customer discusses this issue with the banker, the banker will most probably explain that the customer’s gold is indeed covered by the insurance, because the customer’s gold has a value of, let’s say EUR 2 million, while the bank’s insurance coverage is EUR 600 million. That sounds logic. 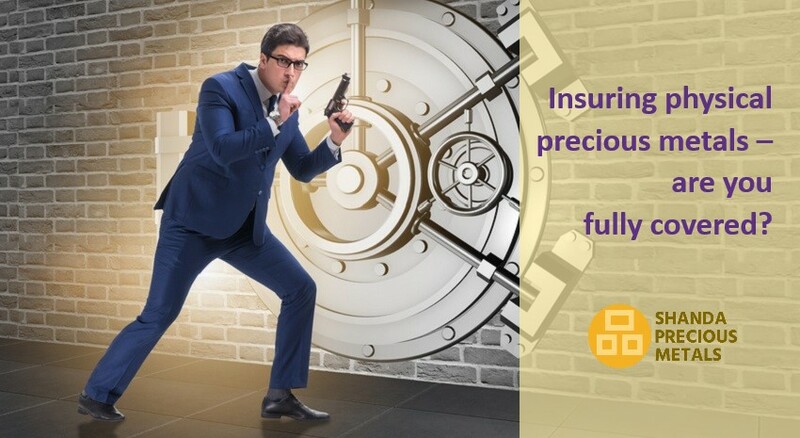 However, in case of robbery or damage of any kind, the insurance company generally pays only the percentage of coverage of the entire gold, silver and precious metals stored. In other words: If gold worth EUR 100 million has been stolen, the insurance company will argue that the insurance coverage of EUR 600 million is 40% of the gold etc. stored, and therefore only pay 40% of the stolen gold; they will pay EUR 40 million for the gold stolen worth EUR 100 million. Another issue to be looked at is the coverage of instances. Insurance coverage of banks does generally not include embezzlement, which means infidelity by employees. Under its brand Shanda Precious Metals, Shanda Consult offers segregated and allocated storage of gold, silver and other precious metals in high-tech and high-security storage facilities in Liechtenstein. Gold and other precious metals stored in the safekeeping facilities in Liechtenstein is always fully insured in the name of the customers, in contrast to an insurance coverage by the safe-keeper’s own insurance. The insurance premium is included in the rental fee. Having his or her own insurance policy, the customer is always ensured that his or her gold or silver or other precious metals are fully ensured. The insurance value coverage includes an increase of value of the gold etc. of up to 20%. Should the value of the customer’s gold, silver or other precious metals increase more than 20%, a new insurance coverage will automatically be arranged with the insurance company. The insurance coverage of gold and silver etc. stored in the high-tech and high-security storage facilities in Liechtenstein does also include embezzlement, meaning infidelity by own employees. Depending on the type of insurance chosen, damage compensation may be provided in form of payments or in form of replacement of the gold, silver or other precious metals. You may read more about our services for precious metals owners on our dedicated website.